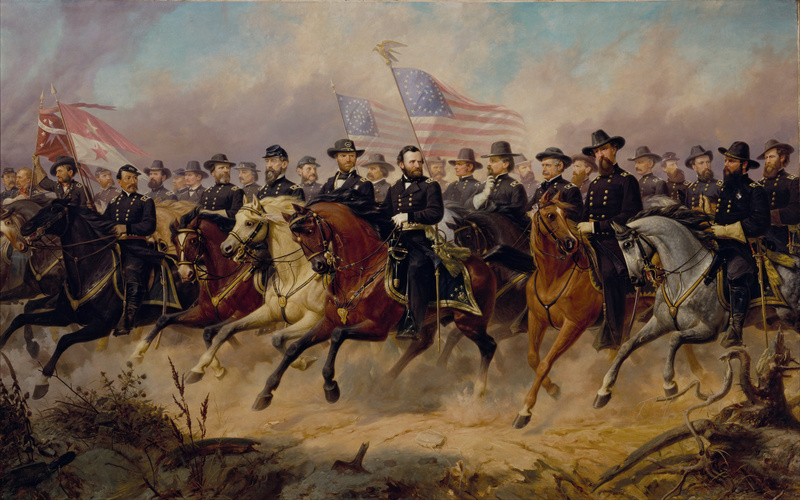 An article in Mother Jones by Ryan Cooper caught my eye recently because it concerned a favorite topic of mine – the American Civil War. Cooper’s article was written in response to Robert Tracinski at The Federalist; the two have been feuding electronically about the coercive nature of law and the feasibility of laissez-faire economics over the past few weeks. Tracinski argues, for instance, that the first 150 years of our history as a nation were a libertarian paradise since the federal government’s share of GDP was under 10 percent and the laws establishing the modern welfare state had not yet been implemented. Cooper rightfully dings Tracinski for ignoring the existence of slavery or Jim Crow in his analysis, as these institutions definitely undercut the argument for 1776-1926 as a beacon of liberty. Yet strangely, Cooper goes on to make similarly reductive arguments in his own analysis. Reconstruction, he says, was a period where “American society as a whole tried reasonably hard to do right by the freed slaves, before getting tired of the effort and abandoning them to the depredations of racist terrorism.” Elements of this argument are true, but to speak of American society as a whole is a fallacy; if the whole of American society tried “reasonably hard” to do right by black people, how does one explain the concurrent existence of racist terrorism? Or the widespread Confederate sympathies in cities such as Baltimore and New York during the war? Cooper goes on to say that since slavery was a moral evil predicated on the coercion of black bodies, “the war that ended slavery, despite involving coercion in the form of organized mass killing, was therefore good!” I agree with Cooper that the morality of coercion depends greatly on the context, but still feel his argument is simplistic. For one thing, the idea that the Civil War was about ending slavery gained popularity as the conflict dragged on, rather than being a goal at the outset. In fact, northerners and southerners reversed their position on the cause of the war in the decades to follow. Whereas northerners were initially adamant that the war was about preserving the Union, in later years they claimed the real cause was emancipation. Southerners, who had no qualms about asserting their pro-slavery aims prior to and during the war, adopted the Lost Cause as a banner in the aftermath of defeat. Finally, for an argument that presents the primacy of slavery to the history of 19th century America, Cooper spends little time with the slaves themselves, content to concern himself with the motivations of white northerners and one quote from Ta-Nehisi Coates. Ironically, Coates once wrote of the war that “the message has long been clear: the Civil War is a story for white people—acted out by white people, on white people’s terms—in which blacks feature strictly as stock characters and props.” Black (and white) resistance to slavery and injustice predated the coming of war and emancipation by at least a century, and this resistance belies the assertion of any benign period of American liberty far more powerfully than the act of emancipation or feeble attempt at Reconstruction. Cooper and Tracinski, though arguing from opposing viewpoints, both present incomplete narratives. Many writers use history in the service of making some larger point, rather than engaging with the full record as it is. It is true, as Tracinski notes, that the growth of the federal government during and after the Civil War had far-reaching – and, at times, negative – implications for American society. It is equally true, as Cooper acknowledges, that government intervention proved necessary to prevent the coercion and exploitation of black Americans. These narratives are not in opposition, but in fact are facets of the same complex story of American society in the 19th century. The question of whether government coercion is a force for good or evil is a distraction. The ultimate lesson to draw from our Civil War history is not, as Cooper asserts, “what can happen when a society really tries to right a past wrong, and tragic, infuriating failure of will.” Nor is it that, as Tracinski asserts, “the welfare and regulatory state…is a historical aberration.” The lesson is that our history, like our people, will forever be a jumble of contradictory claims about liberty, notions of citizenship, and uncomfortable realities. To seek the false comfort of narrative in our history – a weakness we are all susceptible to – will do us no good.